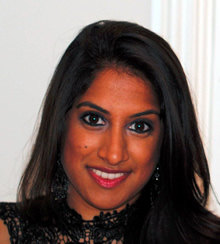 Nikkita is a registered osteopath having qualified from British College of Osteopathic Medicine with a masters degree. Before starting a career as an osteopath she completed a Biology degree from Queen Mary, University of London. As an osteopath, Nikkita’s interests developed to aid treatment for the best outcome for patients. As a result, she has completed post- graduate training in sport & clinical taping techniques and medical acupuncture, which are used where applicable within the treatment program. In addition to working in private practice Nikkita also works for TICCS- The Integrated Care Clinics, which has been a leading provider of rehabilitation services across the UK for 20 years. At TICCS Nikkita has been providing osteopathy to NHS patients in Kent, which has provided her experience and exposure to a large volume of patients with a variety of musculoskeletal complaints. Nikkita enjoys playing a variety of sports including swimming, cycling, golf and judo, which is on a recreational and competitive level. From Nikkita’s sporting background she developed an interest in sports injuries and rehabilitation, and understands from experience the importance to recover and continue playing your sport. Nikkita has experience treating patients of different ages with a variety of complaints ranging from sports injuries, work- related and age- related conditions such as osteoarthritis. Nikkita is registered with the General Osteopathic Council, who work with the public and osteopathic profession to promote patient safety by registering qualified professionals, and setting, maintaining and developing standards of osteopathic practice and conduct.